A stunning mixture of lilys, roses and other flowers, beautifully arranged in a hand-tied and standing in a bubble of water with a big bow and pretty gift message card....choose your own colour! 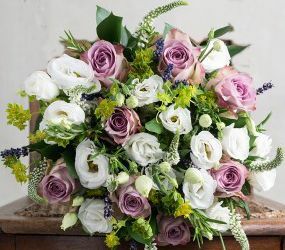 A wonderful selection of Lilys and Roses together with other flowers such as Alstromeria, Lisianthus, Leucadendron together with lovely foliage such as Eucalyptus, Salal, Ruscus, Pittosporum and Palm Leaves. 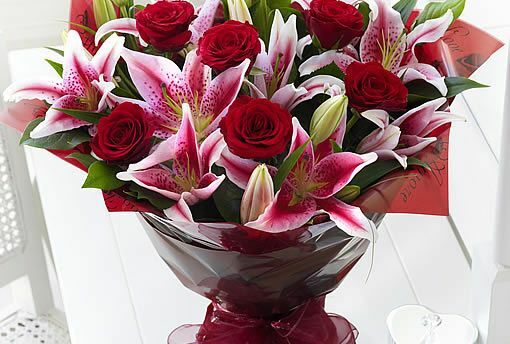 Beautifully presented and standing in their own bubble of water these flowers will arrive as fresh as possible and already tied by our florists so the recipient doesn't have to re-arrange - a lovely gift for all occasions. Includes a floral gift message card.5% online Discount 5% online discount and free delivery in our flower delivery areas including Braintree, Witham Chelmsford, Great Leighs, Great Notley, Black Notley, White Notley, Great Baddow, Cressing, Silver End, Kelvedon, Feering, Tiptree, Great Braxted, Great Totham, Maldon, Little Baddow and Coggeshall and Danbury and surrounding towns and villages.